In the lead up to Halloween, nothing too spooky – just a few tricks and treats you might like to try. You all know how to sort data, but are you aware of some other features that you could use when you want to show how your data is placed within a range? If not, try these! Alternatively, rather than display a message, you might prefer to use formatting to indicate which values are highest and lowest. The image above shows demonstrates the highest and lowest temperature cells formatted with a background colour to make them stand out (cells B6 and B8 above). If you would prefer to be able to rank the data in a range e.g. 1, 2, 3, etc, use the RANK function. 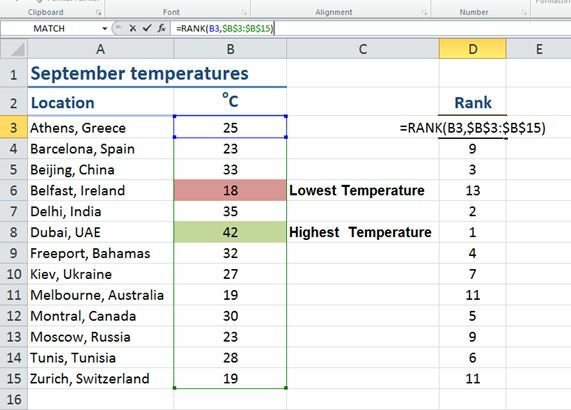 In this example we are working in Column D.
Copy the formula down the column—the rank or relative position against the B3:B15 cell range—will be displayed.